WHERE: in the Citadel Theatre’s Classroom B in the Foote Theatre School. Please enter via the Foote Theatre School doors at the south side of the building. Doors will be open by 10:45 a.m.
Pay-what-you-will at the door. Cash/credit/tap card only ($5-$10 recommendation). Drop in! Wear clothes you can move in. In terms of both training and performance-making, I’m interested in the overlap between text and movement. What are the kinetic shapes of our conversations? How about the velocity and direction of stream-of-consciousness writing? How might we gain a greater sense of the actions of our words through moving, and vice versa? We will start with improvised movement scores to warm up our proprioceptive, spatial, and ensemble awareness. Further in to class we will focus on the overlapping territory between text and movement with solo and group explorations. Bring a pen and some paper and some clothes you can move in. Expect sweet dance jams as well as some discussion. Open to all levels of movers and talkers. Richard is an Edmonton-based performer, creator, and educator working in contemporary dance, theatre, and the spaces in between. Along with a B.F.A. 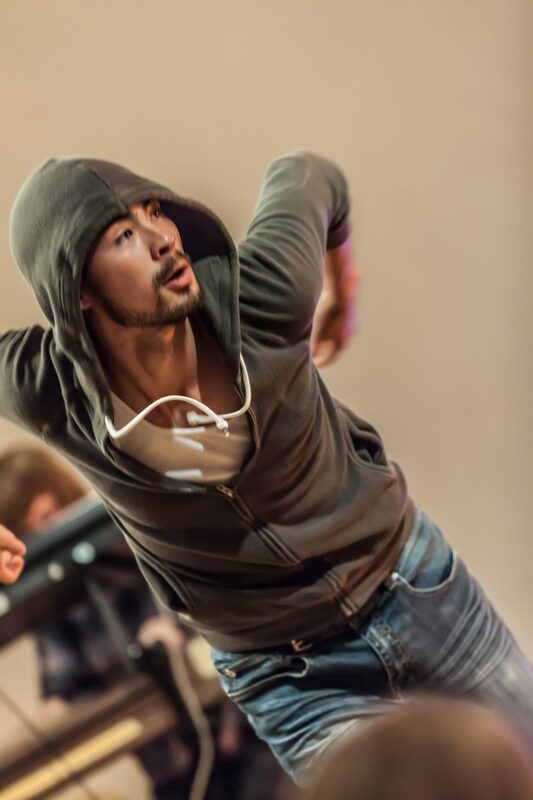 in Acting from the University of Alberta, he has also trained in contemporary dance and contact improvisation across North America and Europe. He has performed for a wide range of dance and theatre companies, some of which include: Citadel Theatre, Alberta Theatre Projects, Mayday Danse, Teatro La Quindicina, The Good Women Dance Collective, Mile Zero Dance, Northern Light Theatre, Edmonton Opera, Concrete Theatre, Alberta Aboriginal Arts, Dancers’ Studio West, Amber Borotsik, kloetzl & co., and Tania Alvarado. His own creations have been presented by CanAsian Dance, Concrete Theatre, Mile Zero Dance, Springboard Performance, The Expanse Festival, Dancers’ Studio West, and The Good Women Dance Collective. This May he had the privilege of being a researching choreographer for Mocean Dance’s CLEaR Forum at the Ross Creek Centre for the Arts in Nova Scotia. As an educator, Richard has taught for the B.F.A. Acting Program at the University of Alberta, MacEwan University’s Theatre Arts program, the Robbins Academy’s Young Company, and Mile Zero Dance. He will also be on faculty for Artstrek 2018, Theatre Alberta’s summer theatre camp for teens.